From the beginning, I was destined to have a love affair with books and music. Books are a topic for another day (and have been). As soon as I could pick my own music, though, I was jamming to Raffi, learning all the words to tv theme songs for The Dukes of Hazzard, The Monkees, Silver Spoons, figuring out how many “nas” were in Batman. I sang into my waterhose mic the songs I'd learned on that day's Dumbo’s Circus. 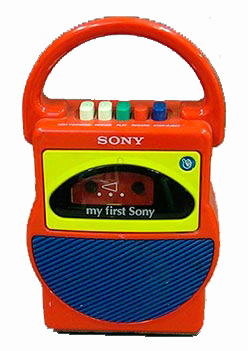 I’d throw my My First Sony over the handlebars of my pink and purple bike and jam out to tapes teaching me how to tell time (stuck) and do math (didn’t). My parents didn’t mind me listening to the New Kids, Wilson Phillips, Cece Peniston, Tevin Campbell... In several instances, though, there were bands that were not worth my Mama’s financial support. Two such bands were Nirvana and Madonna. Luckily, I had a brother to give me the music of people that were speaking directly to my pre-teen heart. I remember Ed giving me a CD of In Utero^ on the sly with an “I knew you wanted this.” He also loaned me Candi’s copy of The Immaculate Collection so that I could dub it onto a tape. I still have both of these things, and consider Tourette’s one of my hype-up songs. From my end, I remember feeling grown-up and "subversive" when I bought my brother cassingles of Damn, I Wish I Was Your Lover and Are You Gonna Go My Way^^ – these were the first birthday presents that I picked out for someone myself. Maybe the most influential music introduced to me through my brother is the self-titled debut of Violent Femmes. I think one of my brother's teachers introduced him, and we listened to the cassette CONSTANTLY. Ed would turn down the volume during the "bad parts" (ummmm...Add It Up, anyone?). First day of school, 1991. Well into the VIolent Femmes era. Can't you tell? We're so punk! *At least, this is how it appears to me. Maybe things would’ve been the same if we’d been two years apart. I’ll never know. **One exception – My mom said that she didn’t want me to see Pulp Fiction when it came out in 1994. I still haven’t seen it (although I was present when some friends in junior high, circa 1995, acted out key scenes with puppets). ^This album will be 20 years old on September 13. WHAT?!? ^^Lenny Kravitz (of this era) was the first overtly sexual artist I recognized. I know that Madonna predates him; however, I always just thought she was costume-y. I’ll cool it with the footnotes now.